Quince (Cydonia oblonga) are the unsung stars of my autumn larder, each resting like an artful still life awaiting a transformative trip to the kitchen. The beefy little orbs tend to be hard as rocks, but release a fruity perfume when appropriately ripe. Their real magic (in addition to outward beauty) comes when the fruit is cooked, at which time it softens further and turns a rich blush or rusty orange, depending on the variety. When I share my quince, I’m always asked, “Well what do you do with them?” I happily share two recipes. One I’ve already posted: Quince Chutney; and another big favorite I will provide here, Quince Marmalade. 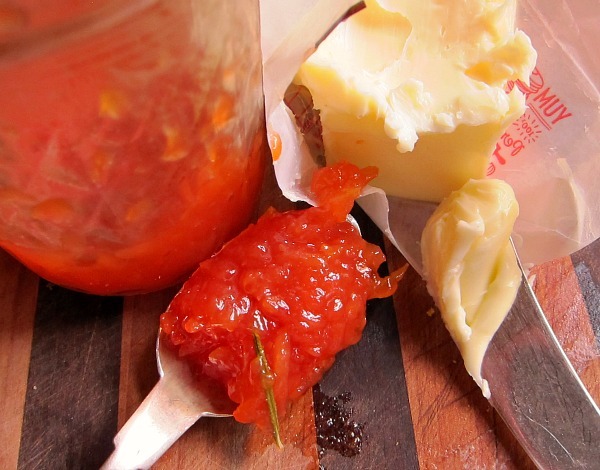 Works well for sweet and savory foods, as a jam or an accompaniment to cheese and Charcuterie. A great recipe that lends itself to adding herbs or spices for a greater depth of flavor. Sometimes I add rosemary or thyme sprigs, and other times, I'll add some whole spices like allspice, cinnamon stick and clove, which I later remove before jarring up. 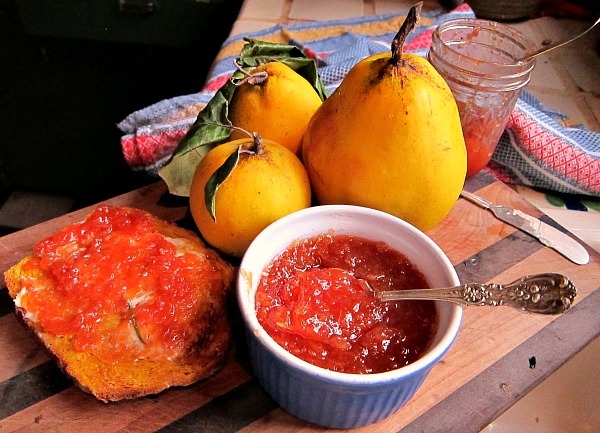 Quince Marmalade is a fine autumn treat, well worth making. If you've never made jam or jelly before, this is a great recipe to try, as it is quite foolproof, and easier to make than most preserve recipes that require setting the fruit to a jellied stage. Wash and chunky chop 3 pounds of quince, no need remove cores or seeds. Put chopped quince in a stock or soup pot. Add enough water to come up to the top of the chopped quince. Pour strained liquid into a preserving pan or stockpot, and add sugar. Simmer on low heat to dissolve sugar. With remaining 2 pounds of quince, remove cores (as you would an apple) and grate with medium grater, skin and all. Simmer until marmalade thickens and changes color from apple white to a glossy rose blush . When you think the marmalade is thick enough, shut off the heat and let it sit. When cooled, check to see if it is a thick marmalade consistency. If yes, then just reheat and simmer to soften the marmalade, and then jar up (1/2-inch head-space) for a 10-minute water bath. If you found the marmalade too runny, just reheat to thicken and then jar up. 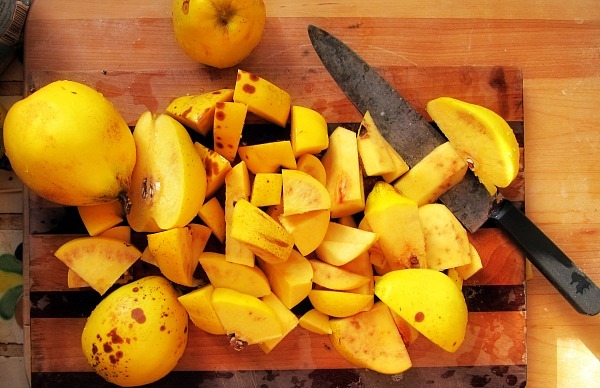 Quince is a pectin bomb and will solidify more readily than most fruits. An hour or two later, a jewel-like spread that packs a tart punch. Your toast and taste buds will thank you. What a beautiful color! I can imagine the jars lined up in your pantry. Eileen, I think I’ll do a little tidying up of the pantry and share a few photos, just for fun. Hi Tom, what is the best way to store quince once it is off of the tree? This brings back memories, as a child we had 2 quince bushes in our back yard and my mother was always after the kids not to pick the fruit as they were not apples and we would be happy with the final product if we let them ripen. Of course, we would always pick one ot two just to see how they tasted. I musr say that your bushes produce more fruit than ours. Vern, I think I need to bring you a jar of quince jam next time I visit. You need to see what you’ve been missing. Quince Jam always reminds me of my country of birth Lebanon. In summer Quince would be plentiful and everyone would be making quince jam in readiness for winter. Such a beautiful colour and taste. wonderful memories. Yours looks like what my grandmother would make. Hi Paul, my dear grandfather was born in Lebanon, too, and I had no idea, quince was so plentiful there. So glad this post sparked some fond memories. Thanks for the kind comments. ah quince, the cook’s fruit! One of my favorites. Looks like it likes your climate Tom… more so than Virginia. Your young tree is certainly productive. I make quince jam or marmalade every year (well every year I can get my hands on some), some years plain, some years not quite… This year I made a double quince jam: European quince slices in Japanese quince jelly… flavored with fresh ginger. Pretty good with the tartness of teh Japanese quince and the floral quality of the European. I just took my pumpkins out of the oven to cool abit before I purée them. And then I see this page. Quince wow! Yours look fabulous! I had a hard time finding any this fall. I’m on the Oregon coast and no one seems to know what they are. I poached up what I found to make a Quince Custard Cake from Apt.2Bbakingco. It’s so yummy! I will try your marmalade next time I find some more. Sounds very easy. Thanks! Thanks Chris, and here’s to finding more quince for future recipes! It didn’t work for me, ended up sickly sweet and runny. Wouldn’t thicken up. Had to throw the whole lot away. (That said, it was my first attempt at jam making). Amendment to my previous note above: after receiving advice from a ‘jam maker’, I reheated the one jar I didn’t throw out, and it worked, it is now jam!!! Lovely rose colour and pleasant sweetness (I did add shredded Quince to it), so it is a success! I am now kicking myself for throwing away most of it earlier. Just wanted to thank you for this recipe. It turned out amazing!!! We grated the quince on the coarse grater and let it really reduce and change color to rosy red/orange. The whole house smells amazing! Got 5 jars out of 3.6 lbs of quince; used 3.5 cups of sugar and juice of 2 lemons. Used the cold plate method to determine if the marmalade set instead of letting it cool and then reheating it. I work for Schare and Associates, we are a Food Trading and Distribution company. We specialize in the purchase of over stock bulk food ingredients. I was wondering if you might have anything in inventory that you might want to liquidate. Some of the items we purchase, but not limited to these, are bulk packed frozen juice concentrates, frozen fruits, purees and vegetables. These can be older packed products, expired, slightly off spec., etc. Please let me know if you have any problem inventory like this that you need to move. I look forward to hearing from you. Thank you. Hi Marie, Thanks for your inquiry but I use all the fruit and juice I have. I wish overstock was a problem. 😉 Well wishes in the New Year. Great recipe! However don’t throw the pulp out! I put mine through a food mill, add some lemon juice sugar and a good sized hunk of butter to taste and voila, you will have quince butter! I freeze mine, sometimes I freeze in ice trays and bag . Great on toast or with pork or lamb roast. Fabulous thank you! 11lb fruit, 11 huge Kilner jars of ruby red quince jam 😃 did add Grande Marnier for added depth & about to make the quince butter with the left over pulp! Hi atom, what is the bedt way to store quince ? I want to keep some for making Xmas tar tar tin. Basement? Garage? I am in Wisconsin. Anne, that’s a tough one, as I find quince doesn’t store very well. In fact I went to make jam with mine this week and the outsides looked great but the interior flesh was brown. You live and you learn. I would refrigerate them the minute the fruit is picked, which will slow down the process. I would say quince lasts unrefrigerated about a month. I have apples that will last in cold cellar for 3-4 months, but not my quince. 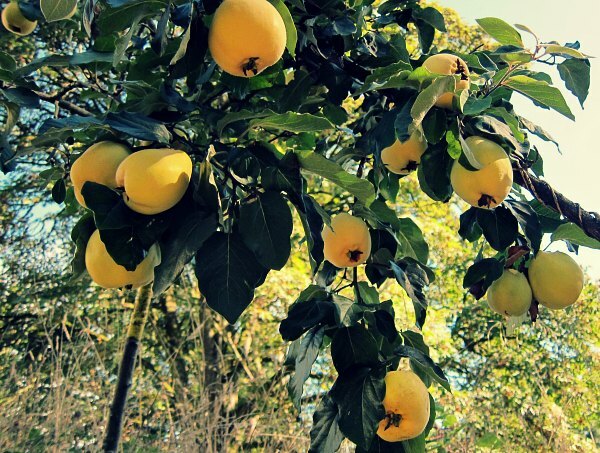 With refrigeration you get 1.5 – 2 months out of the quince. You could can them early as they are firmed textured and will work handily when baked, keeping shape and form in a tarte tartin. Good luck! Crazy delicious! I added a stick of cinnamon and a teaspoon of cloves when cooking the chopped quinces in the beginning since I couldn’t smell my quinces and didn’t trust their subtlety. IT came out Devine. Nice touch Julie, I bet those spices give it a little somethin’ somethin’ – I’ll have to try that next time. Thanks for the tip!